A comprehensive reference source to the history, technology, uses and aesthetics of the optical lantern in its many forms. 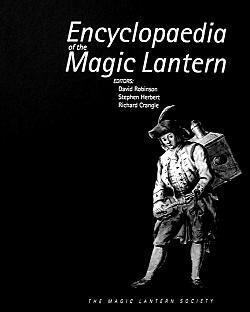 The Encyclopaedia of the magic lantern is arranged in alphabetical entries. These cover a wide range of subjects: inventors and patentees, makers and merchants, showmen, writers and lecturers; the fascinating variety of styles and shapes of lanterns, with all their delightful and exotic names; the ingenious mechanisms of slides; the organisations that used lanterns for education, propaganda or religious persuasion; and of course the collectors, collections and museums. London: Magic Lantern Society, 2001. Search by article title and access digitised issues of The Magic Lantern (2014-) and The New Magic Lantern Journal (1978-2014).